Do you know how you know that you have truly become a Beauty Blogger? Is it when you find yourself buying beauty products, not because you need or sometimes even want them, but because you want to write a blog post about them? Nope, it's when you've managed to convince someone else to part with a large amount of cash buying all of the things that you really fancy, but can't actually afford, so that you can *cough* "test the products out on their behalf". Yep, I've gotten to that stage with my Mum. Back in 2010, I introduced her to Urban Decay, and now I have brought OPI into her Rimmel-obsessed life. When it came to introducing her to Urban Decay, I wasn't worried about whether she'd like the products or not, because she'd actually been "introduced" to them all by the Sales Assistant in Debenhams through a mini make over, so she knew that she liked them before she bought them. As OPI is a great deal more expensive than Rimmel, however, I was a little worried that this time I might have got it wrong. Normally, this wouldn't concern me, because she always quips that if she doesn't like, then she'll give it to me (see, I definitely see a lot of benefits out of this ;P), but when it's something a little bit pricier than the average, I feel a bit guilty about it. She ended buying a full-sized bottle of Diva of Geneva, and luckily, she absolutely loved it. She loved the fact that you only need one coat to see how amazing the colour was, and she also loved how quickly they dried. Another aspect that she was impressed was the size of the brushes of the full-sized bottles, which was an area I've never had chance to know about, since I've only ever owned mini's. And as a result of new-found love, she purchased the collection that this whole blog is about (yeah, long-winded introduction I know, but I thought it was interesting...sort of!!). Wokka Wokka is an absolutely stunning and vibrant red berry shade, and even though OPI describe it as festive, which it of course is, I also feel that it will be a perfect summery colour. Not entirely sure how the colour fits in with the name (maybe someone can enlighten me?! ), but I love the name nonetheless. Possibly the best named polish in existence, but a strange polish I have to say. As you can definitely tell, it is a very glittery pink shade that lives up to it's name in that it does make a statement. But, the colour isn't really to my taste. I don't know what it is, but it just doesn't appeal to me. My Mum and I, however, have taken to wearing this as a top coat over dark pink and red shades which works really nicely, and I highly recommend this product for that purpose, especially if you want to spice up a colour a little bit. We've yet to try it with other colours, but I'm not personally convinced that'll work too well. 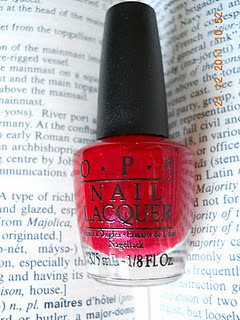 When I first looked at the Muppets Mini Collection, this was the polish that I was the most intrigued by. It looked, to me, like it was going to be a metallic brown shade, and I really like metallic-based colours. Unfortunately, Designer...De Better! isn't like that at all. Instead, it is more of a very subtle shade, that looks more like a very light silvery taupe shade than brown, which looking at the picture, yeah, I can see how it's that colour. But, yeah, I'm not too keen on it anymore. Another polish with a great name, I'm really glad that the photo picks up on the golden undertones of Warm and Fozzie, because I think that they are what makes this a fantastic colour to wear, because even though it's a brown (and I really hate browns!! ), the gold makes it a really beautiful colour. It's probably not a shade that you would wear for work, but then again, you probably wouldn't wear any of these shades for work. Overall: I really love this collection, even if it doesn't belong to me *sob* and I definitely recommend it, because it wasn't what I expected it to be at all. You can either buy these four as a set, or some of them can be bought separately, in full-size bottles. The Lena White website, also features a range of other colours within The Muppets Collection, which are also worth a look. I love these! At first I thought I liked Warm and Fozzie (how cute!) then Designer... De Better caught my eye, but I also like Excuse Moi and you can't go wring with a classic red!Even though they're Muppet inspired, they're not cheesy in any way, still really stylish; I'm very impressed and now I want them!